Cumberland Valley’s blend of charming and vibrant downtown areas makes this region a true destination. Each town’s unique mix of specialty shops, historical architecture, local museums, and distinctive dining experiences make it an adventure waiting to be discovered. 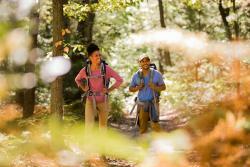 So put on your walking shoes and explore our towns to discover hidden gems. Check out the list below which features one highlight (ok, maybe two are mentioned) from each town that will be sure to guarantee a memorable overnight or weekend trip. The Allenberry Resort is a premier destination for relaxation. The 250-seat Playhouse entertains guests with mainstage plays and musicals, family productions, comedy, movie nights, musical acts, and guest speakers. Following the show, enjoy dinner at The Barn and then retire to one of the resort’s luxurious rooms. Be sure to fit in an appointment at the on-site spa and don&apos;t leave without purchasing Allenberry&apos;s famous sticky buns at their cafe. For those seeking additional outdoor adventure, Allenberry’s Outdoor Activities Director can arrange for guests to partake in fly fishing, trap shooting and sporting clays, golfing, rock climbing, kayaking and tubing, biking, or hiking along the nearby Appalachian Trail. Shopping opportunities abound in Camp Hill, but the must-stop location for locals in this lively community is Cornerstone Coffeehouse. With its incredible collection of hot or iced coffee, tea, espressos, frappes, and lattes plus delicious sandwiches, you’ll find this the perfect place to take a break. 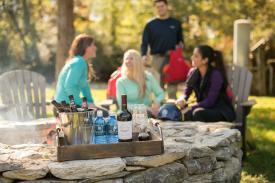 If the weather cooperates, sit outside on their deck or walk down the street to the peaceful Willow Park. With so many dining, shopping and entertainment choices, it’s hard to choose just one location in Carlisle. But to get the best sense of the Cumberland Valley and its history, the must-see attraction is the Cumberland County Historical Society. The award-winning museum features 16 galleries with stories of local history spanning 250 years. The museum shop – History on High – is the perfect location to pick up a souvenir and also houses the Cumberland Valley Visitors Center, making it an ideal first stop as you begin your journey through the Valley. The 82-acre Adams-Ricci Community Park has a massive children’s play structure, five trail loops, walk-in access to the Conodoguinet Creek, and a butterfly garden. Stop by the seasonal, producers’ only farmers market held every Thursday afternoon from May through October. When you want to escape head to Pine Grove Furnace State Park where hiking, biking, swimming, fishing, and boating opportunities abound. With numerous trails, including the famous Appalachian Trail, plus two lakes, the Appalachian Trail Museum, and the Ironmaster’s Mansion, you can find a full day of fun. The 60,000-square-foot West Shore Farmers Market sells the freshest produce, seafood, meats, cheeses, dried foods, candies, plants, and baked goods. The vast selection and delightful aroma will tempt your taste buds. The upstairs shops offer designer clothes, jewelry, and other high-quality unique products. Bursting at the seams with all things related to the Civil War, visitors to Civil War and More can step back in time as they browse books, collectibles, music, flags, and even neckties. The owner is an expert on local Civil War history and is happy to answer your questions about Cumberland Valley’s role in this conflict. With 7 miles of trails and an abundance of plants and wildlife, the 913-acre Mount Holly Marsh Preserve along the rocky slopes of South Mountain is perfect for nature lovers and hikers. 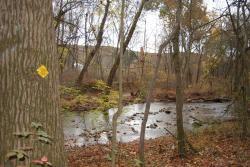 Fishing is permitted along Mountain Creek which is stocked with trout by the Pennsylvania Fish & Boat Commission. Celebrate the luck of the Irish at Oxford Hall Celtic Shop. The store gives lovers of Celtic wares a unique opportunity to find authentic Irish, Celtic and British apparel, jewelry, wedding and engagement rings, food, religious items, art, music and more. Your visit is not complete with a quick bite from their Tea Corner Café. Visitors of all ages can hike, bike, walk, or horseback ride on the 13-mile Cumberland Valley Rail Trail that follows the abandoned Cumberland Valley railroad corridor from Newville to Shippensburg. Visitors can now also enjoy a newly-opened two-mile offshoot of the CVRT which runs from the underpass at Route 233 just south of Newville to Green Hill Road. The H. Ric Luhrs Performing Arts Center on the campus of Shippensburg University is a 1,500 seat regional theatre hosting year-round performances including rock, country, pop, Broadway, comedians, family shows, symphonies, speakers and more. 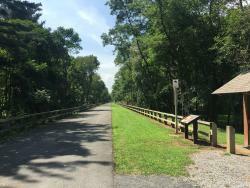 You can also start or finish your trek along the Cumberland Valley Rail trail at the two Shippensburg trailheads -- one at Shippensburg Township Park and the other at Shippensburg Station. If you make it to Shippensburg Station, be sure to visit the recently opened Cumberland Valley Railroad Museum. Experience al fresco dining at its best when visiting one of the three restaurants located along the Susquehanna River in Wormleysburg. 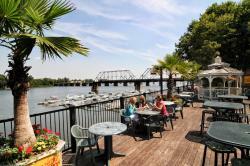 Each restaurant features its own distinct menu and atmosphere but all three have decks that provide scenic views of the river and the Harrisburg skyline. Dukes boasts a great drink menu and is ideal for happy hour. Dockside Willies offers reasonable prices and great food in a family-friendly atmosphere. RockBass Grill&apos;s casual fine-dining atmosphere features fresh seafood and steak. Although Dockside Willies was recently damaged by a fire, the restaurant is expected to come back better than ever.